MODERN MACHINE SHOP 99 BETTER PRODUCTION Design for Manufacturability FORCE MEASUREMENT PRECISION TOOLS / GAGES HARDNESS TESTERS The Authority on Accuracy. New Digital Video System works vertically and horizontally. 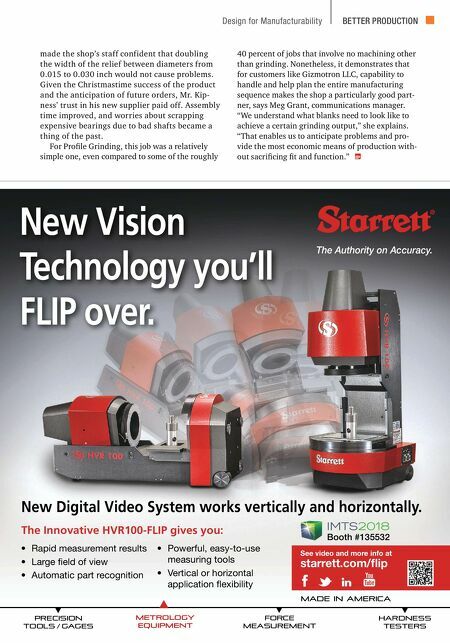 See video and more info at starrett.com/flip • Rapid measurement results • Large field of view • Automatic part recognition • Powerful, easy-to-use measuring tools • Vertical or horizontal application flexibility The Innovative HVR100-FLIP gives you: MADE IN AMERICA New Vision Technology you'll FLIP over. METROLOGY EQUIPMENT Booth #135532 made the shop's staff confident that doubling the width of the relief between diameters from 0.015 to 0.030 inch would not cause problems. Given the Christmastime success of the product and the anticipation of future orders, Mr. Kip- ness' trust in his new supplier paid off. Assembly time improved, and worries about scrapping expensive bearings due to bad shafts became a thing of the past. For Profile Grinding, this job was a relatively simple one, even compared to some of the roughly 40 percent of jobs that involve no machining other than grinding. Nonetheless, it demonstrates that for customers like Gizmotron LLC, capability to handle and help plan the entire manufacturing sequence makes the shop a particularly good part- ner, says Meg Grant, communications manager. 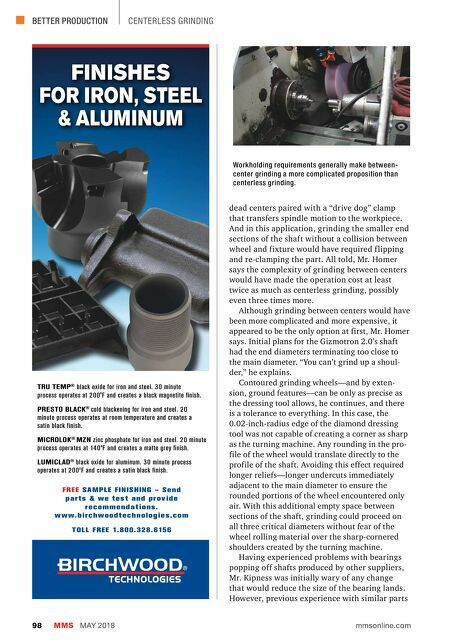 "We understand what blanks need to look like to achieve a certain grinding output," she explains. "That enables us to anticipate problems and pro- vide the most economic means of production with- out sacrificing fit and function."